Back to sharing cool food art with you. I saw this article on artist Seiji Kawasaki and was amazed by his realistic wood carvings of food. If he didn’t leave some raw wood showing on this asparagus you’d think it was real. Or how about these potato chips? Follow Kawasaki on Instagram or check out his website. Tags: follow friday, food art, wood carving | Permalink. 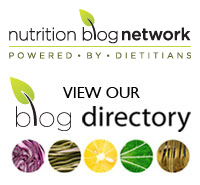 I'm a registered dietitian from Nova Scotia, living and working in Ontario, Canada. My goal is to help people relearn how to have a healthy relationship with food.